When I got back to town on Thursday I went straight to church and dropped off Tristan with my mom so I could go home and get a nap. After the nap, the three of us went to the grocery store. It was Tristan's first trip in a shopping cart and, as usual, he did awesomely. He rode the whole time. Anyone who knows my mom knows she takes about 2 hours at the store, so Tristan riding the whole time is amazing. 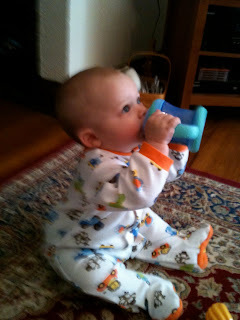 I'm also working with Tristan on using the sippy cup. He's doing pretty good, but I'm not sure he totally gets all the mechanics, even though he can get a drink out of it periodically. Tomorrow I'm going to start hitting it hard. I'm going to put his formula in the sippy cup for the meals where he eats food.